Next time you're planning to cook a potato dish, swap out the regular potatoes for sweet potatoes. 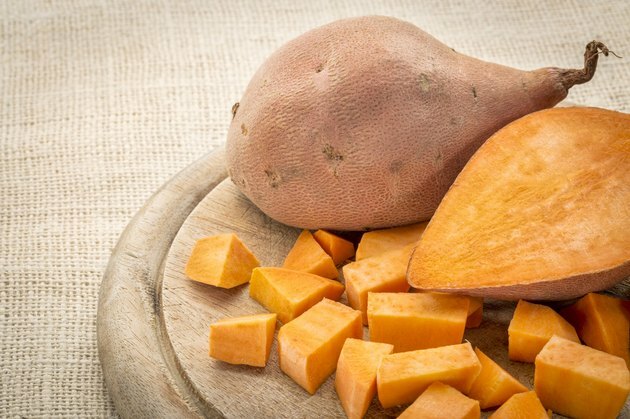 The type of sweet potato you choose and how you prepare it affect how nutritious it is, but regardless of the type you prefer, these vegetables can be a part of a healthy diet. Sweet potatoes come in a variety of colors, including those with white, yellow, orange or purple flesh. The purple varieties contain the most antioxidants, and the white-fleshed varieties contain the least of these beneficial nutrients, according to a study published in "Food Chemistry" in 2007. The purple sweet potatoes aren't widely available in the United States, but if you're debating about a white sweet potato versus an orange one, go with the orange. Orange-fleshed sweet potatoes contain more beta-carotene, which your body can turn into vitamin A. Baked sweet potato with the skin on is healthier than boiled sweet potato without the skin. The skin contains beneficial fiber, and boiling the potato causes some of the vitamin C and certain B vitamins to leach out into the cooking water. Both types of sweet potato, however, are more nutritious than a regular potato, providing more fiber, vitamin A, vitamin C and manganese.